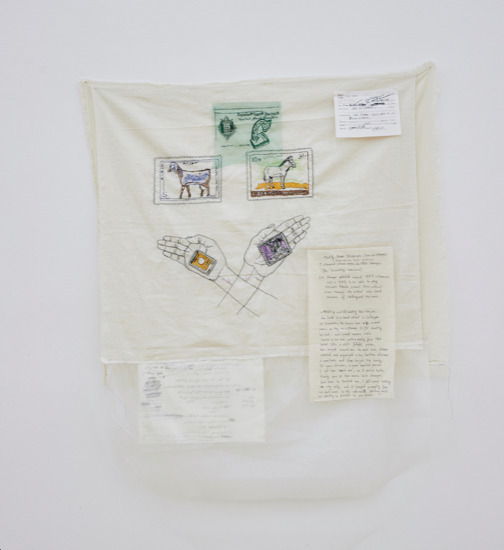 Mounira Al Solh's artistic practice, using video, painting, embroidery and performative gestures, brings together biography and history: the individual's experience becomes a key to speculating on wider social realities. An inherent tension plays itself out with humour, visible vulnerability, and self-knowing irony - an approach which allows the artist to take on complex and delicate issues such as nationalism or gender, putting herself, her friends and family directly on the line. 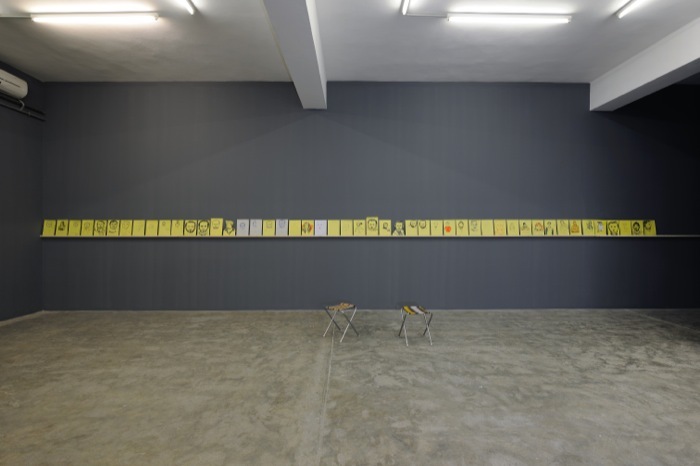 Al Solh's recent solo presentation include KW Berlin, CCA Glasgow, SMB Amsterdam, and Kunsthalle Lissabon. She took part in biennials in Venice, Marrakech, Bucharest, Istanbul, and Thesalloniki, and exhibitions at Heie Onstad Kunstsenter, Heiderlberger Kunstverein, Badischer Kunstverein, New Museum New York, Calvert 22 London, Mori Art Museum Tokyo, Art in General New York, Tate Modern London, Haus der Kunst Munich, Van Abbe Museum Eindhoven. A series of portraits as a growing body of work which will encompass 1000 portraits as a time document. The series is illustrated from interviews with Syrians who were exiled to Lebanon. The conversation is depicted through fragmented scribbles that highlight dramatic changes forced upon people’s lives in times of political turmoil. This work is made of various hand-knit and machine-knit sentences on intimate surfaces, that help me register my notes and contradicting thoughts and findings resulting from an on-going research on language which I mostly continue doing at nighttime, as it is the most silent part of the day, where language can least be heard, and if it is heard, it does not have to make sense. This work is made of various hand-knit and machine-knit sentences on intimate surfaces, that help me register my notes and contradicting thoughts and findings resulting from an on-going research on language which I mostly continue doing at nighttime, as it is the most silent part of the day, where language can least be heard, and if it is heard, it does not have to make sense. Once the notes are registered, the sewing can be made at any time of the day. 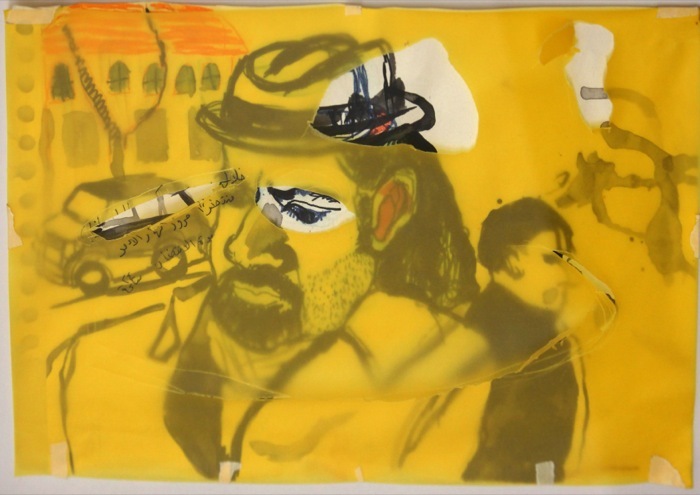 The work is by Bassam Ramlawi, a character imagined by Al Solh. He is the son of a juice vendor and lives in Basta. However, his Basta upbringing and life has another side to it. He is also a painter, heavily influenced by artists like Otto Dix, Rene Daniels, and Cindy Sherman. This particular painting combines these two sides of his life. On one hand, he has painted the figure of Sylvia von Harden from Otto Dix's famous painting of the journalist. Her presence creates and refers to the sexual tensions and longings of Ramlawi. This is further made manifest in the Mickey Mouse motif in the painting and in the shape of the canvas, because Bassam makes Mickey a symbol of his sexual arousal. 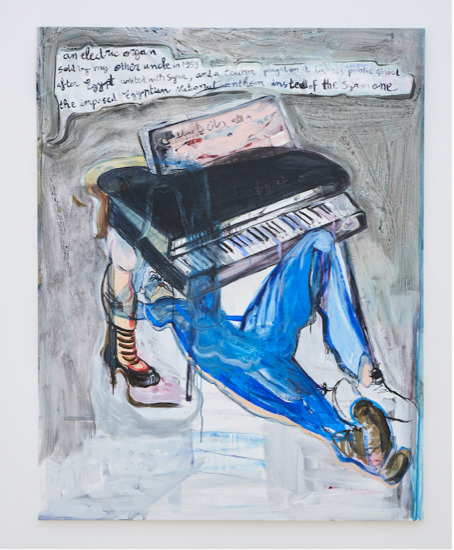 Another signifier of the sexual tension is also the electrical wires and tubes in the work, which also refers to his life in the busy Beirut neighborhood. Another motif that we see is the bow tie or butterfly shape. You see them painted on the top of work as well as in the perspectival structure of the canvas. 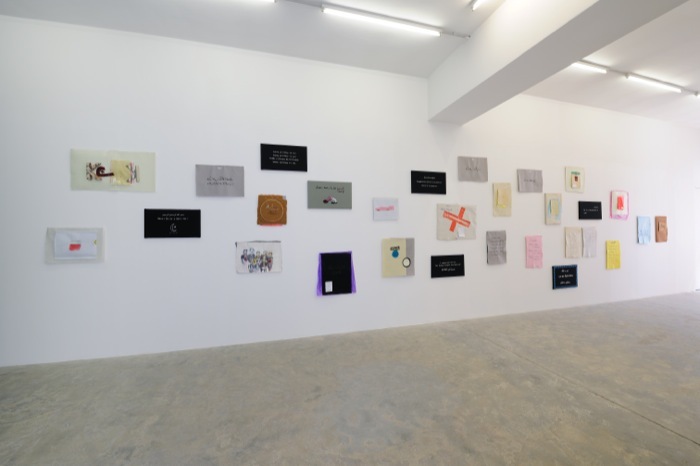 These refer to the perspective drawings and paintings of gallery spaces by Rene Daniels, shedding light on artwork within the white cube gallery space and especially the placement of works by Bassam's work within the white cube. All images courtesy Sfeir-Semler Gallery, Hamburg and Beirut.